← Is Adventure Travel Right for You? All packed and ready to go on the great adventure! Maybe you too have been there. The large crowd of people huddled around the baggage claim area slowly dissipates and suddenly you realize that you’re the only one standing there. Then you hear a clunk and the conveyor belt grinds to a slow stop. You get that sinking feeling in your stomach when you realize that your luggage will not be joining you on your vacation. You spent hours creating a list of what you needed to pack and then packed it in your bag, making sure the weight met airline guidelines. You checked and rechecked your list to make sure you hadn’t forgotten anything. All for not at this point. Your bag is in lost baggage limbo. This happened to me recently on our trip to Kamchatka, in far Eastern Russia. Fortunately I had packed my hiking boots in my carry-on so I had one piece of essential gear for our hiking/camping tour. The rest of my vital gear – a warm sleeping bag, comfortable sleeping pad, warm clothes and rain gear, medication, and clean clothes and underwear – had disappeared into the ether. I had traveled from Denver, through JFK, and on to Moscow with seven other people. All of their bags made it so why hadn’t mine? I’ll never know what happened but I do know that what transpired during the rest of my trip and afterward was nothing short of a nightmare. I was told that my bag was still in New York and that Aeroflot would get it on the next plane to Moscow and then on to Petropavlovsk where it would join me the day following my arrival. Doing quick time conversions, we realized that was not realistic but it was reasonable for it arrive in Petropavlovsk the day after that. We would have already left for the backcountry by then but our guide company had another tour leaving the day after ours that would pick up the bag and deliver it to me. In the meantime, I had to buy some replacement gear, fast. I bought a pair of hiking socks, a pair of hiking pants, two shirts, a GoreTex jacket with removable inner coat, some underwear, and a couple day’s supply of my allergy medication (fortunately most everything is over the counter in Russia). I would borrow a sleeping bag and sleeping pad from the tour company. We headed off to great unknown. To make a long story short, my bag never arrived in Petropavlovsk. Our guide company called Aeroflot and customs in Moscow, begging and pleading with them to get my bag to them. When I was able to get cell coverage, I called my family in the States and asked them to hassle Aeroflot, and I made a few calls myself to Aeroflot, customs and our travel insurance assistance line (well more than a few, our international cell phone bill added up to more than $400 and my family’s phone bill was well over $100 – ouch!). All to no avail – after several days, my bag had made it to Moscow but customs would not release it. No one at Aeroflot or Moscow customs cared enough to take the initiative and get my bag sent through to me. My only hope was to pick it up when we returned to Moscow two weeks later. Our guide later told us that customs would not release my bag because I had valued the contents too high (what, did they think I was going to sell my stuff on the Russian black market?!). It was a long two weeks. I had to resort to wearing some of my husband’s clothes, so not only was I inconvenienced, but he was as well since he now has many fewer clothes than he had planned on. I did pick up my bag at customs in Moscow when we flew back through on our way home. When I returned home, I filed a claim with Aeroflot. Another run around: I called the New York office who told me to email Moscow, who told me to send a claim and all supporting documentation to the New York office, which I did. When I didn’t hear back, I called the New York office who was not answering their phone so I emailed Moscow, who then forwarded my email to New York, who then emailed me to tell me that my claim had been sent to Moscow for review! I also filed a complaint with the U S Department of Transportation, and it turns out that they communicated with Aeroflot and that was instrumental in getting my claim processed. After about 60 days, I emailed Aeroflot and was notified that they would be reimbursing me some of my phone calls and 70% of the cost of the clothing I had purchased. The 30% reduction was “because these items have remained in your [my] possession.” I have now filed a claim with my travel insurance company to try to get compensated for the rest of the expenses I incurred. Don’t assume that your lost baggage will reappear when the airlines tell you it will; expect it to take longer. Buy enough new gear and clothing so that you are comfortable on your trip. Keep everything: boarding passes, luggage tags, receipts for items you purchased to replace lost items, every little piece of paper related to your lost baggage. You’ll need them all for filing claims. Assess the delayed baggage/lost baggage limits of your travel insurance. The standard plans are probably way too low to help you replace everything lost – ours pays up to $100 for delayed baggage claims and only $500 for lost bags. I’m quite sure my gear would have cost close to $4,000 to replace had my bag been lost for good. Take 1-800 numbers for your airlines and travel insurance trip assistance plans and call them immediately. Take as many of the things you’ll absolutely need in your carry-on. I had my hiking boots but didn’t have my daily medications or a change of clothes even. 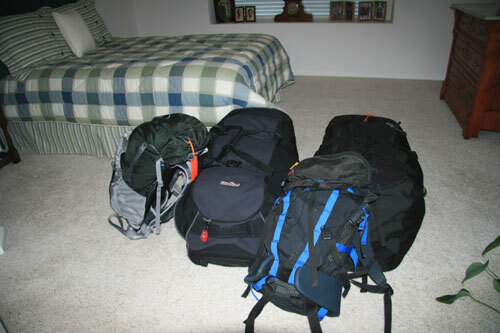 If you are traveling with a companion, consider splitting up your gear between the two bags. That way if one bag doesn’t make it, at least you both will have some clothing. Try as hard as you can to not let your lost baggage ruin your trip. It’s amazing how you can get by on less than you thought. Update: I just received word from our travel insurance company that I will not be receiving any payment from them for the lost luggage claim. They say that I received more from Aeroflot than the coverage they would have paid so they owe me nothing. It’s definitely time to find a new travel insurance company – this one was worthless! This entry was posted in Travel Tips and tagged airlines, lost baggage, tips for dealing with lost luggage. Bookmark the permalink. I hadn’t heard of that website but will check it out! Thanks. Did you call Aeroflot to discuss reimbursement or was it just through email? I had a similar experience but they are not returning my emails about reimbursement. I’m wondering if you did email, what address did you use? And any tips you have? I did call their office in New York and the first time I called I was able to talk with someone. After that they were less than helpful and difficult to get on the phone. I don’t remember anymore what email address I used.